[S323] Sir James Balfour Paul, The Scots Peerage: founded on Wood's edition of Sir Robert Douglas's The Peerage of Scotland (Edinburgh, Scotland: David Douglas, 1904), volume I, page 28. Hereinafter cited as The Scots Peerage. [S11] Alison Weir, Britain's Royal Families, page 272. 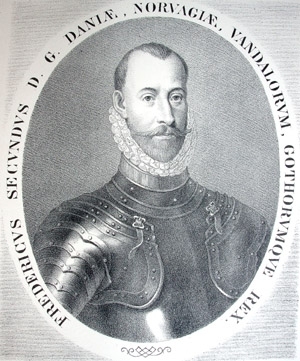 Frederik II Oldenburg, King of Denmark was born on 1 July 1534 at Haderslev, DenmarkG. 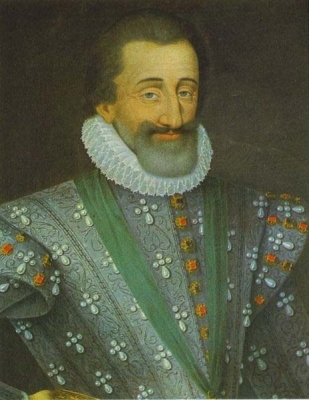 He was the son of Christian III Oldenburg, King of Denmark and Dorothea von Sachsen-Lauenburg.3 He married Sophia von Mecklenburg-Güstrow, daughter of Ulrich III Nestor Herzog von Mecklenburg-Güstrow and Elizabeth Oldenburg, Princess of Denmark, on 20 July 1572 at Copenhagen, DenmarkG. He died on 4 April 1588 at age 53 at Antvorskey Castle. He was buried at Roskilde Cathedral, Copenhagen, DenmarkG. 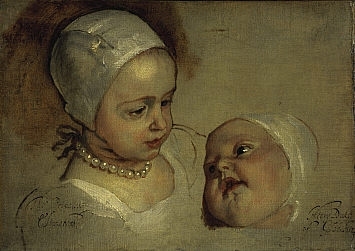 Sophia von Mecklenburg-Güstrow was born on 4 September 1557 at Wismar, Mecklenburg-Vorpommern, GermanyG. 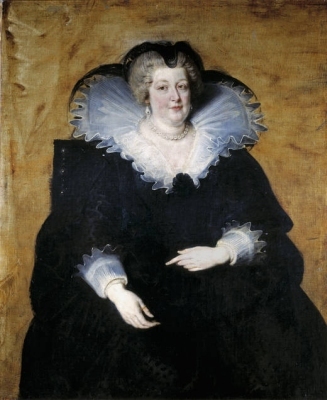 She was the daughter of Ulrich III Nestor Herzog von Mecklenburg-Güstrow and Elizabeth Oldenburg, Princess of Denmark.1,2 She married Frederik II Oldenburg, King of Denmark, son of Christian III Oldenburg, King of Denmark and Dorothea von Sachsen-Lauenburg, on 20 July 1572 at Copenhagen, DenmarkG. 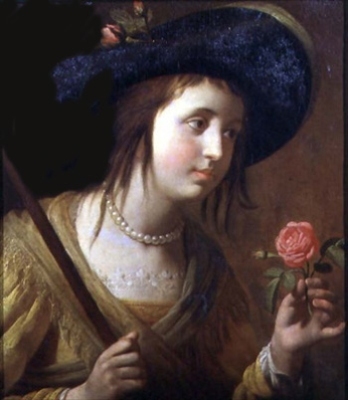 She died on 4 October 1631 at age 74 at Nykøbing, Falster, Denmark. [S11] Alison Weir, Britain's Royal Families: The Complete Genealogy (London, U.K.: The Bodley Head, 1999), page 249. Hereinafter cited as Britain's Royal Families. [S11] Alison Weir, Britain's Royal Families: The Complete Genealogy (London, U.K.: The Bodley Head, 1999), page 252. Hereinafter cited as Britain's Royal Families. 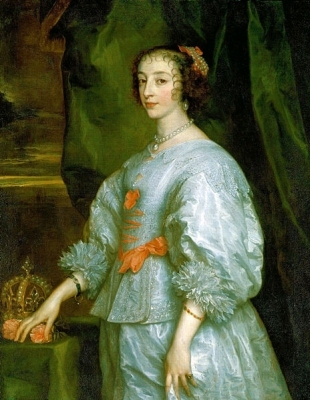 [S11] Alison Weir, Britain's Royal Families, page 252, says 21 August 1669. [S323] Sir James Balfour Paul, The Scots Peerage, volume I, page 29. 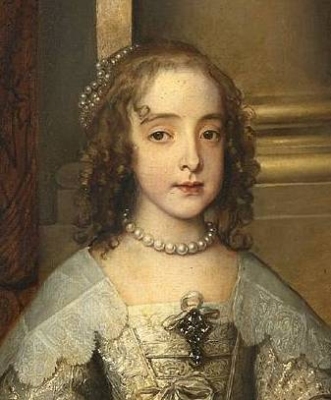 She gained the title of Reine Marie de France. [S11] Alison Weir, Britain's Royal Families: The Complete Genealogy (London, U.K.: The Bodley Head, 1999), page 253. Hereinafter cited as Britain's Royal Families. [S11] Alison Weir, Britain's Royal Families, page 257. [S6] Cokayne, and others, The Complete Peerage, volume III, page 91. [S6] Cokayne, and others, The Complete Peerage, volume III, page 280. [S3437] G. Steinman, A Memoir of Mrs. Middleton: great beauty of the time of Charles II (n.n. : n.n., 1864). Hereinafter cited as A Memoir of Mrs. Middleton. 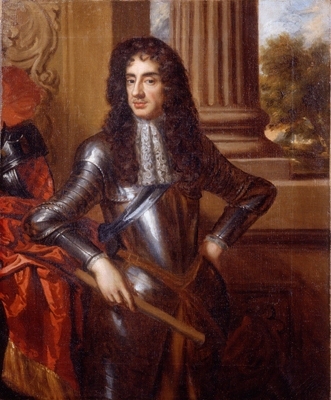 [S18] Matthew H.C.G., editor, Dictionary of National Biography on CD-ROM (Oxford, U.K.: Oxford University Press, 1995), reference "Charles II, 1630-1685". Hereinafter cited as Dictionary of National Biography. [S11] Alison Weir, Britain's Royal Families, page 256. [S6] Cokayne, and others, The Complete Peerage, volume II, page 366. [S8294] Peter and Roger Powell Beauclerk-Dewar, Right Royal Bastards: The fruits of passion (Wilmington, Delaware: Burkes Peerage & Gentry, 2006), page 23. Hereinafter cited as Right Royal Bastards. [S6] Cokayne, and others, The Complete Peerage, volume III, page 282. [S11] Alison Weir, Britain's Royal Families, page 255. [S323] Sir James Balfour Paul, The Scots Peerage: founded on Wood's edition of Sir Robert Douglas's The Peerage of Scotland (Edinburgh, Scotland: David Douglas, 1904), volume I, page 32. Hereinafter cited as The Scots Peerage. [S323] Sir James Balfour Paul, The Scots Peerage: founded on Wood's edition of Sir Robert Douglas's The Peerage of Scotland (Edinburgh, Scotland: David Douglas, 1904), volume I, page 29. Hereinafter cited as The Scots Peerage.